The Ta-Se is a Rank II Japanese self-propelled anti-aircraft vehicle with a battle rating of 1.7 (AB/RB/SB). 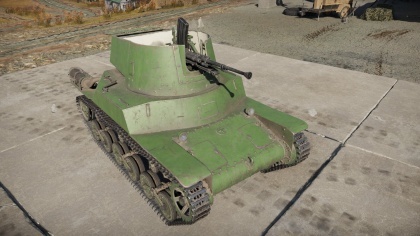 It was introduced along with the entire Japanese Ground Forces tree in Update 1.65 "Way of the Samurai"
The Ta-Se is a fast turreted SPG armed with a 20 mm autocanon. 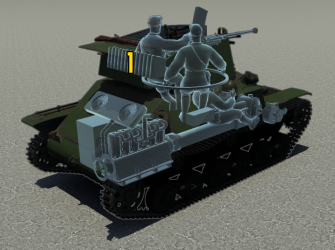 It can serve both as an AA or, in urban/small maps, as a close-quarter flanking vehicle. With a fair 24 hp/ton ratio (fully upgraded), the Ta-Se has enough mobility to follow other light tanks. Its light weight makes breaking through obstacles a bit challenging, but, its canon can break most of them before making contact. With fairly narrow tracks, this vehicle is easily slowed down by rough terrain. While not being the best rank 1 AA autocanon (this title belong to the German Flakpanzer 38(t) Gepard), this little gun is still very suitable to engage planes. Load in your API-T belt, voilà !, you are now ready to hunt down tanks. As an antitank weapon, this canon really shines. With a slower rate of fire than its German counterpart, it is easier to shoot one bullet at a time with good accuracy. One can easily take out one ground target/magazine (provided you know where to shoot). Shoot the gunner first, the driver/engine to immobilise your prey and then finish off every other crew member by sniping them. One big downside to being such a fast and versatile vehicle (both AA and AT) is that armor is light, very light, at an average of 12 mm. 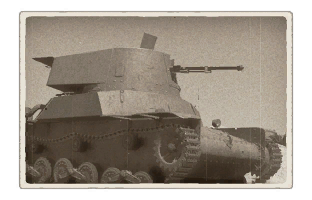 This means you won't survive any shot bigger than MG fire: play smart and always flank, strike fast and retreat at the littlest threat (arty, other enemy tank, strafing plane, etc.). Since two out of three crew members are located in the turret (with their head popping out of it), do not expect to survive any more than one shot. Belly armour is 9 mm thick. Turret underside armour is 9 mm thick. Shooting at aircraft, you can make use of it's maneuverability to evade enemy bombs or bullets. This is not a spectacular AA since it's fire density is not so great, requiring every shot to be pinpoint on target to hit. Bring 5-6 full HE belts to take this role in case there is planes coming your way. Any good SPAA tactic works fine with the Ta-Se. Any aggressive player will greatly enjoy taking this little brute into a close quarter fight. Its fast speed and turret turning rate allow for intense action and multi-target engagement. At this BR, 45 mm of penetration is more than enough to incapacitate most enemy tanks. But beware of its limited ammo count and always engage your target with a fully loaded magazine. It is reccommended to spray the gunner first and then taking your time to snipe every other crew member. Whenever an artillery strike is coming your way, be it friendly or enemy, do not stand there for too long since a single shell can wreck this tank. One last warning: never engage heavy targets, instead: flee. 20mm autocannon is more than enough to take out planes at its BR and API-T belt can even take out light tanks and medium tanks from the side. 17 magazines of 20 bullets each. Loader's and commander's head are exposed from the turret. Low firing rate and dispersion, make every shot count. One Ta-Se prototype was built in 1941. The vehicle design never saw production. This page was last edited on 13 February 2019, at 16:39.